Such a lovely dress on you! I'm into floral and girly dresses this summer too! This dress is too adorable!! Love the florals and your sunnies! Love the dress with the casual shoes! Those sunglasses are amazing. I love that bag! This is such a pretty look! What a great floral piece! And I love the lighting for these photos. Loving the entire look! These photos are stunning! Love the vintage dress Sabrina! Great look! The photography of your blog is so pretty! The lighting is amazing! I really like this dress and how you styled it. You look great! Nice eyewear. Check out the blog for the latest eyewear trends. I follow you ... and you'll look for me .. I recently moved to a big city and suffer from nostalgia too ;( btw you look amazing in this dress! I love your outfit. 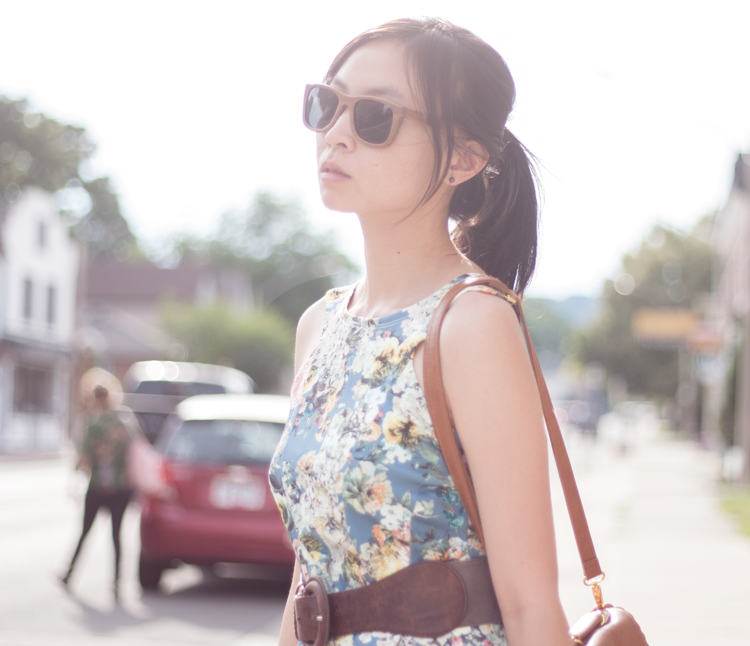 The floral dress is so pretty and I love your sunglasses. I am glad you have found a spot to help with homesickness. Cute dress! Love those sunnies! your bag is so cute, i love it! I like that your outfit is so summer casual! I love this look ! You're so pretty and the bag is just beautiful ! Beautiful dress, love thse photos! you look so cute, chic, vintage and classy at the same time! Perfect look! That bag is so sweet! The photos are so nostalgic and beautiful! I really love it! I also like your belt! Where you bought it? Beautiful dress, and the way the sun was shining was picture-perfect. Lovely pictures, so nostalgic! It's difficult to get used to live in another place. Your dress is very pretty. Love the scalloped bag from ASOS. You look amazing. I love this outfit and your sunglasses are the best!